Is Western Condemnation of Cultural Destruction Reserved Exclusively for Enemies? International organizations, Western governments, and mainstream media are vociferously outraged–and rightfully so–over the recent destruction of majestic Sufi Muslim shrines by Islamist extremists in Timbuktu, Mali, mirroring the reaction to the Taliban’s 2001 demolition of two beautiful Buddha statues in Bamiyan, Afghanistan. The violators of cultural rights in both instances are anti-Western, al-Qaeda-linked groups, and that alone seems to have merited the strong Western condemnation. Otherwise, why has the West maintained its overwhelming silence regarding the complete destruction of the world’s largest medieval Armenian cemetery by Azerbaijan, a major energy supplier to, and arms purchaser from, the West? In December 2005, clerics from the Armenian Church of Northern Iran videotaped over 100 uniformed men across the border in ex-Soviet Azerbaijan destroying the thousands of breathtaking and unique Armenian khatchkars, or cross-stones, of the magnificent Djulfa cemetery. The church later issued photographs clearly showing that the sacred site had been replaced by a military rifle range. Azerbaijan vehemently denied the destruction report, suggesting that the cemetery, like the medieval Armenians it memorialized, never existed in the first place. (Official historiography in Azerbaijan claims that Armenians did not live in the South Caucasus region until the 19th century.) To protect its case, Azerbaijan subsequently banned European observers (and years later, a wavering U.S. ambassador) from visiting the cemetery site, thereby compelling the American Association for the Advancement of Science (AAAS) to document the crime with satellite data. The AAAS joined the European Parliament and ICOMOS, an organization for cultural preservation, as one of a few international institutions to document or condemn Djulfa’s destruction. Washington’s public reaction to Djulfa’s destruction, however, came months after the devastation in the form of a written response to a question posed by California Senator Barbara Boxer (D). In their response, the State Department “urg[ed] the relevant Azerbaijani authorities to investigate the allegations of desecration of cultural monuments in Nakhichevan,” essentially downplaying an entire culture’s obliteration by irresolutely calling it “desecration,” an oft-used description for gravestone graffiti vandalism. In private, however, the State Department was aggravated—not with Azerbaijan’s wanton destruction, as suggested by a leaked cable, but with Armenia’s “strongly worded press release” condemning it. The international organization charged with protecting our global heritage, UNESCO, followed suit, Washington style. UNESCO’s only public reaction to Djulfa’s destruction was a response to my 2010 petition, wherein the organization expressed its readiness to dispatch an investigative mission, contingent on the consent of the perpetrator, Azerbaijan, and otherwise failed to condemn the destruction. In other words, UNESCO has effectively committed itself to indefinite silence by asking Azerbaijan to willingly work against its perceived political interests, a near certain impossibility. 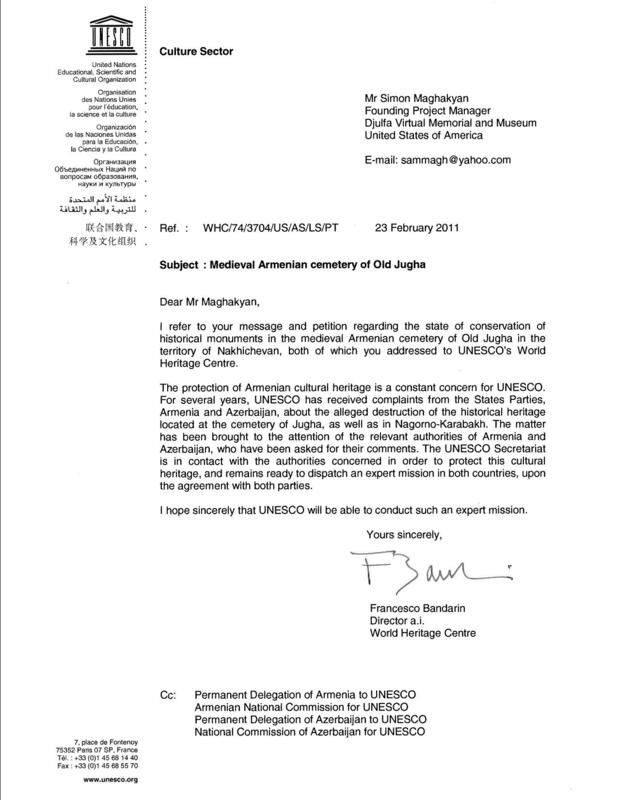 As expected, Azerbaijan did not react to UNESCO’s proposal. 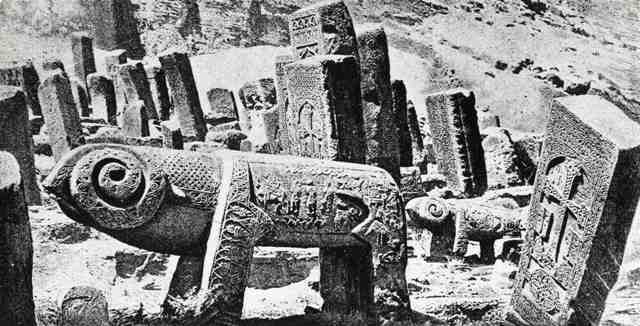 While Azerbaijan’s destruction of Djulfa failed to elicit any meaningful response from UNESCO, the organization did spring into action after the word “Djulfa” was mentioned in a 2011 exhibit of Armenian cross-stones. Even after censoring the word, UNESCO boycotted its own exhibit, because a photo of the cemetery was still included in the exhibition, albeit without a caption. The impetus behind the cemetery’s destruction and ensuing political machinations is the territorial conflict between Azerbaijan and Armenia over the region of Nagorno-Karabagh, but the obliteration of Djulfa took place in an undisputed region—Nakhichevan. And while the United States, as a mediator in the Karabagh conflict, is expected to remain impartial, a muted response to the well-documented destruction of a major cultural site cannot be equated with evenhandedness; it is, in fact, counterproductive as it reinforces a primary cause of the conflict: the Armenian perception that Azerbaijan has intentionally been wiping out all traces of their indigenous identity without accountability. Washington’s response to Djulfa’s destruction has likely been muted, in part, by Azerbaijan’s vast energy resources, which Baku sells to Western markets via Turkey. Azerbaijan’s arms purchases from Israel, as well as its speculated status as secret staging ground for a possible attack against Iran, may also play a part in the silence over Djulfa’s destruction. While Washington’s mealy-mouthed response may be predictable given its energy and security interests in Azerbaijan, UNESCO’s inaction is unacceptable, as is the silence of much of the international media (with a few exceptions). It is troubling that Washington’s selective condemnation of cultural rights violations, which are apparently based on perceived self-interests, is mimicked in international media coverage as well as in the actions of an international organization ostensibly created to stand up for all vulnerable and threatened heritage. In what appears to be appeasement for failing to take a stand on Djulfa’s destruction, UNESCO indirectly acknowledged the value and vulnerability of Armenian khatchkars by declaring their craftsmanship and symbolism Intangible Cultural Heritage in 2010, without any mention of what until five years earlier was the largest collection of khatchkars on earth. Djulfa’s destruction, like that of the Bamiyan Buddhas and Timbuktu shrines, merits widespread coverage, unwavering condemnation, and international liability, no matter who the perpetrator is.